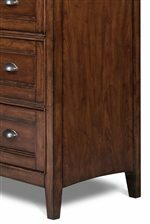 This functional media chest will lend your bedroom a traditional feel. 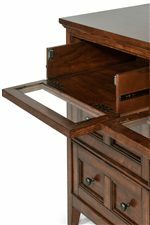 The chest has four spacious drawers, plus two more upper drawers with glass drop down front for easy storage of electronics components. The warm cherry wood finish goes gorgeously with the antique brass hardware. The Harrison Media Chest With 4 Drawers and 2 Drawers With Drop Down Glass Fronts by Magnussen Home at AHFA in the area. Product availability may vary. Contact us for the most current availability on this product.